Description: It erases confidential files from your computer permanently. Normal file deletion will remove a file's directory entry and allocation table information. The actual disk clusters that contained the file's data remains intact on your hard disk and can be recovered later. It overwrites the space occupied from a file with random data and erases the file, so an unerase utility will never be able to recover it. 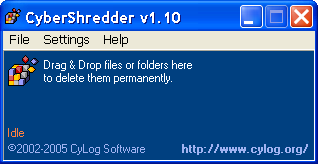 It has three different methods of deleting files including the NSA approved seven-pass file deletion method.